Turmeric, a plant indigenous to south Asia, is used in foods, cosmetics, and some medicines. It has also been used in traditional medicines for thousands of years. Consequently, pesticide residue analysis of turmeric and other spices is required by many countries. For example, Canada has set maximum residue limits for 42 different pesticides in turmeric root, and the US EPA has set tolerance limits for a variety of pesticides in root and tuberous vegetables, of which turmeric is included. 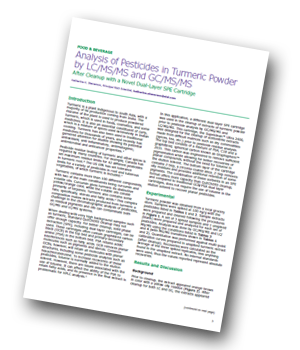 Katherine Stenerson (MilliporeSigma, USA) has recently produced an article describing an application of LC-MS/MS and GC-MS/MS for the analysis of pesticides in turmeric powder after cleanup with a novel dual-layer SPE cartridge. Turmeric contains more than 100 different components, with two of the main constituents being curcumin and volatile oils. Curcumin gives turmeric its distinctive yellow/orange colour, while the volatile oils consist primarily of terpenes. Turmeric also contains some fats; specifically, sterols and fatty acids. This complex composition makes extracts produced from turmeric a challenge in the chromatographic analysis of pesticides, as residual pigments and oils can contaminate both GC/MS and LC/MS systems. When dealing with very high background samples such as turmeric, standard QuEChERS cleanup may not offer enough capacity. For better cleanup, solid phase extraction (SPE), including dual-layer cartridges, can be used. These cartridges often contain graphitized carbon black (GCB) in the top bed and primary-secondary amine (PSA) in the bottom bed. PSA retains acidic interferences such as fatty acids. GCB removes planar molecules such as pigments and sterols. Common GCBs, however, will retain all molecules with planar structures, including some pesticide analytes such as hexachlorobenzene. To increase recoveries of these pesticides, toluene is normally added to the elution solvent. However, there are issues associated with the use of toluene. It can affect the ability of the PSA to retain fatty acids, and its presence in the final extract is problematic for HPLC analysis. In this application, a different dual-layer SPE cartridge was used in the cleanup of extracts of turmeric powder prior to pesticide analysis by GC/MS/MS and LC/MS/MS. This cartridge, the Supelclean™ Ultra2400, was designed for the cleanup of acetonitrile extracts made from difficult matrices such as dry commodities (spices, tea, etc.) prior to pesticide residue analysis. The top bed consists of a mixture of PSA, C18 and a graphitized, spherical carbon known as Graphsphere™ 2031. This carbon was engineered to remove sufficient pigmentation while allowing for better recoveries of planar compounds, without the need for toluene in the elution solvent. The bottom layer of the cartridge contains Z-Sep, a zirconia-coated silica. Z-Sep removes oily residues and provides additional retention of some pigments. The combination of these sorbents in an SPE format offers more capacity than QuEChERS cleanup, and compared to traditional GCB/PSA dual layer cartridges, does not require the use of toluene in the elution solvent to recover planar pesticides.